Inspecting, cleaning/sanitizing, and/or sorting damaged, outdated items donated by grocery stores. Building care packages for seniors on an assembly line. Inspecting and sorting assorted frozen meats in our clean room. Please note: Although the clean room is kept cool, it is not a freezer. Inspecting and packaging other donations including bread, produce, pasta, and frozen vegetables. Adding labels to cans and other food packaging. Collecting food donations at community events. Activities may include event set-up and tear-down. Plan to spend your volunteer shift on your feet and moving around (breaks are allowed, of course!). Please be advised that there may be lifting involved with your volunteer assignment (our boxes weigh between 10 and 30 pounds). Please remember to wear closed-toed shoes, no sandals. Thank you for considering a volunteer assignment with us. 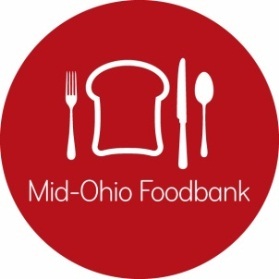 For questions or to learn more about becoming a Mid-Ohio Foodbank volunteer, please email or call 614.317.9703.